Free to Play Sonic Lost in Mario World, start your free game now (2016). 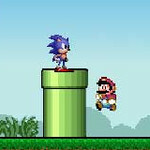 Description: Play as Sonic the Hedgehog in the Mushroom Kingdom. Nice concept, but the gameplay is a little off.